Use chart filters to show or hide data in your chart. Use the Select Data Source dialog box to edit the data in your series or rearrange them on your chart. Let’s start with chart filters. Click anywhere in your chart. Click the Chart Filters button next to the chart. On the Values tab, check or uncheck the series or categories you want to show or hide. If you want to edit or rearrange the data in your series, click Select Data, and then follow steps 2-4 in the next section. Right-click your chart, and then choose Select Data. You can also get to this dialog box from the Value tab in the Chart Filters gallery. In the Legend Entries (Series) box, click the series you want to change. Click Edit, make your changes, and click OK.
Changes you make may break links to the source data on the worksheet. To rearrange a series, select it, and then click Move Up or Move Down . Note: You can also add a data series or remove them in this dialog box by clicking Add or Remove. Removing a data series deletes it from the chart—you can’t use chart filters to show it again. In Word and PowerPoint: Select your chart and then on the Chart Design tab, click Edit Data in Excel. 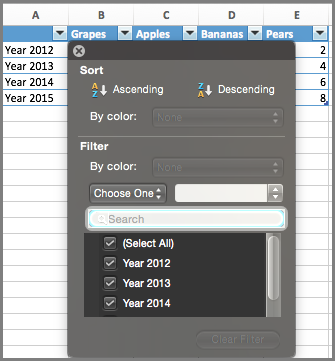 In Excel, select the category title and then in the Home tab, click Sort & Filter > Filter. Next, click the drop-down arrow to select the data you want to show, and deselect the data you don't want to show. 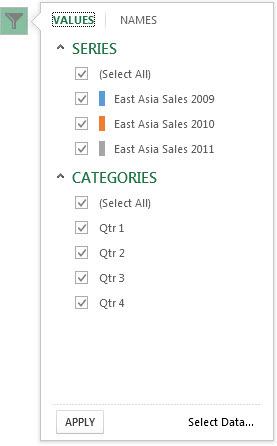 On the ribbon, click Chart Design and then click Select Data. This selects the data range of the chart and displays the Select Data Source dialog box. To edit a legend series, in the Legend entries (series) box, click the series you want to change. Then, edit the Name and Y values boxes to make any changes. Note: Changes you make may break links to the source data on the worksheet. To rearrange a legend series, in the Legend entries (series) box, click the series you want to change and then select the or arrows.